Jordan's branch of the Muslim Brotherhood formally cuts ties with the main branch based in Egypt. Jordan's branch of the Muslim Brotherhood has formally cut ties with the region-wide movement based in Egypt, a spokesman said Monday, according to AP. The decision is the latest setback for the wider Brotherhood, once seen as the main political beneficiary of the 2011 Arab Spring uprisings but hit hard in recent years by government crackdowns, noted the news agency. The Jordanian branch has undergone several splits over the past year, with breakaway groups emphasizing a domestic agenda. The original core group decided late last week to change its bylaws and cut ties with the parent movement, said a spokesman, Moath Khawaldeh. "On Thursday, the Shura Council met and amended the basic law, disconnecting the Muslim Brotherhood in Jordan from Egypt," he was quoted by AP as having said. Khawaldeh added the decision is part of reform efforts ahead of internal elections next month. Compared with the tough crackdowns on Islamist groups in Egypt and Gulf countries, Jordanian authorities have been relatively tolerant of the Brotherhood's presence. Jordan has, however, arrested several members of the group after they publicly criticized the government for not taking stronger measures to censure Israel after the Gaza war in the summer of 2014. Jordanian analyst Ibrahim Gharaibeh told AP on Monday he believes the core group came to see its parent movement as an increasing liability. "This led to political concerns (for the group) in Jordan and the group's ability to survive," he said. 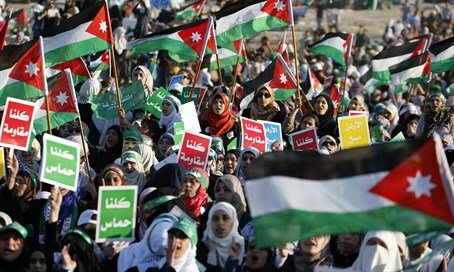 The group objects to Jordan’s peace treaty with Israel and has often organized protests calling for its cancellation.